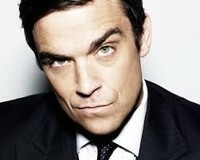 Robbie Williams (1974) is a British pop singer. From 1990 to 1995, Williams was part of Take That. After that period he became a successful solo singer. He is again a member of Take That. Williams is the best-selling British solo artist in the United Kingdom and the best selling non-Latino artist in Latin America. Six of his albums are among the top 100 best-selling albums in the United Kingdom. He won fifteen BRIT Awards (more than any other artist) and seven ECHO Awards. In 2004 he was inducted into the UK Music Hall of Fame, when he was described as "the greatest artist of the nineties."